PocketSprite is a new tiny retro handheld games system, which has this week launched via the Crowd Supply crowdfunding website, and has already nearly raised its required $20,000 pledge goal. Thanks to over 380 backers with still 41 days remaining on its campaign. 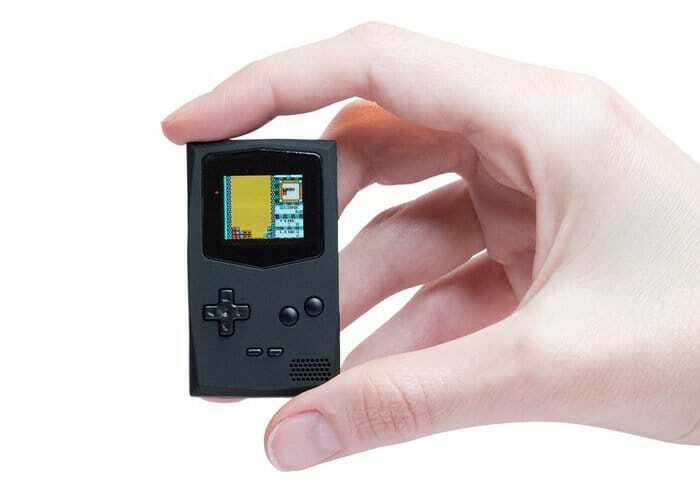 The tiny keychain PocketSprite games console comes pre-loaded with two emulators in the form of the GNUBoy and SMS Plus. Allowing you to play “every single game” from the Nintendo Game Boy, Nintendo Game Boy Color, Sega Master System and Sega Game Gear consoles. PocketSprite measures just 55 x 32 x 14 mm and is powered by a ESP32 dual-core 240 MHz MCU supported by 520 KB RAM, 448 KB ROM with 128 MBit flash the storage all enclosed in an injection moulded ABS enclosure. Other features include a small 13mm mono speaker and connectivity provided by LE Bluetooth and wireless. The retro games console is also open source and everything the team has created will be posted on their GitHub repository once the campaign is completed. The small games console is equipped with an even smaller OLED screen measuring just 25 x 22 mm and offering a resolution of 96 x 64 pixels, offering 60+ frames per second gameplay. The integrated internal battery is capable of providing hours of gameplay and offers months of standby time, after which it can be recharged using the integrated micro USB port. PocketSprite is now available from $55 from the Crowd Supply website and if all goes well is expected to start shipping out to backers during May 2018. For more information, full specifications and a list of all available Crowd Supply pledges jump over to the official campaign page by following the link below.